One of the things that many Postcrossers ask for is a traditional food or recipe from your country. I'm not sure that we have many traditional Canadian foods. There is poutine, of course, and for dessert we have butter tarts and Nanaimo bars. And for drinks - my personal favourite at the moment - a Caesar. None of these have ever been represented on a stamp. and, interestingly, while searching for information I found that most of the pictures on various websites looked nothing like the versions on these two stamps! 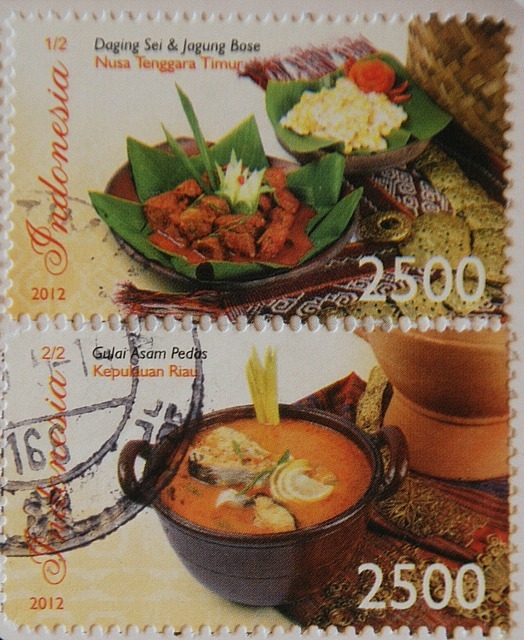 The second stamp shows a gulai asam pedas which translates as sour and spicy goulash. Or what we might call a spicy curry fish stew. All of these might be perfect for a cold winter's night... which seems a long way off as we reach temperatures with humidex values of mid 30's overnight and nearing 40C this afternoon, with more of the same tomorrow. But for now, I will make do with another bloody caesar. What's with this poutine jazz? It's not something I would particularly enjoy. I prefer vinegar on my chips!